Growing up in America, I have been well acquainted with a little rhyme that teaches us how important our fruits and vegetables are. “An apple a day keeps the doctor away.” My family, and a few school teachers, used that rhyme to encourage me to always eat my veggies (which I usually never had a problem doing). However, as an adult studying herbalism, I ran across a little leaf that might work better than apples at keeping us healthy, happy, and long-lived. Gotu Kola, Centella asiatica, is a tiny little leaf with HUGE health impacts. And the best part is that it is also found, abundantly, here in Florida! Every time I walk near fresh water ponds, lakes, or streams, I find this little plant. I also find a plant that gets confused with Gotu Kola. 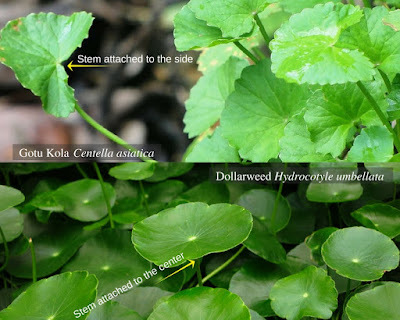 Dollarweed, Hydrocotyle umbellata, is often mistaken for Gotu Kola. While both plants are edible and used in similar ways, they are not the same and correct identification should be made. Both plants like to get their feet a bit wet, but Dollarweed prefers to be in super soggy or completely waterlogged soil. Gotu Kola likes things to be a bit dryer than that, while keeping things nice and moist. Often times I'll find both plants around the same pond, but Dollarweed will be in the pond, and Gotu Kola will be just beside the pond. Granted there will be areas where both are perfectly happy, this is usually one of the major differences. There are also physical differences. Dollarweed's stem protrudes from the center of the leaf. This leaves the leaf mostly round. And it's about the size of an old silver dollar (which is where it get's it common name). Gotu Kola's stem comes out the bottom of the leaf, which makes the leaf tend towards an arrowhead shape. Once correctly identified, this amazing little plant is super useful. The most commonly used part of the plant is the leaf. Not only does it have amazing health properties, but it's also edible. Several herbs I find can be described as a pot herb (you cook it in a pot before eating), and while this makes a great little pot herb, it's also super tasty raw. Add it to your salads, soups, and teas. There are even sodas made out of Gotu Kola, mostly I've found these in Asian Grocery Stores, but I have also run across them in little mom-and-pops around town as well. Such a super nutritious, healthy, and tasty herb deserves to be in each and every meal! Traditional Chinese Medicine (TCM)- Known as either Lou de da or Ji xue cao. In China, this herb is often called the “Fountain of Life” after a folktale about a man who extended his life by over 200 years just by consuming a single Gotu Kola leaf a day. This herb is typically used to clear heat, and dry dampness. Most often used for gastrointestinal disorders related to damp heat. Also useful to help stop bleeding, and clear heat from the liver and eyes. Ayurveda- Known as Brahmi or Mandukaparni. Ayurvedic medicine works to bring the three doshas (http://www.eattasteheal.com/ayurveda101/eth_bodytypes.htm) into balance. Most herbs work on one or two doshas. Gotu Kola, however, works on all three. It's often used to help improve mood disorders, enhance intelligence, regulate blood sugar, and as an anti-convulsant. Adaptogen- This herb has a wonderful balancing effect on the mind and body. Helping the body to adapt to every-day stress, and to balance out moods. Brain and Memory- Gotu Kola consumption has been linked to an increase in cognitive abilities. It not only stimulates the circulation of blood in the brain, but it also stimulates brain function and memory. There is major promise that it can help slow down the effects of Alzheimer’s and dementia in elderly patients. While most herbs that improve cognitive function are purely stimulants, Gotu Kola is more centering. Which makes this herb a good ally in cases of ADHD, as it improves cognitive function and concentration without being over stimulating. In certain parts of the world, teachers give children a single Gotu Kola leaf before starting their classes, to help them concentrate. 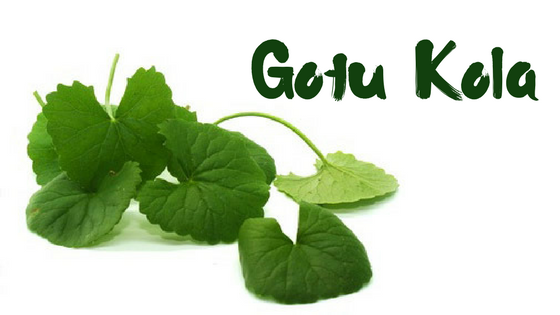 Skin and Wounds- Gotu Kola, when used on wounds, stimulates circulation specifically around the wound. This helps to speed the healing process and prevent infection. It also helps to reduce the appearance of scars, wrinkles, and blemishes. It's also an amazing antioxidant which helps keep the skin looking young. Poisons- In Thailand, Gotu Kola is used to detoxify patients with Opium poisoning. Other places use Gotu Kola to remove other toxins from the blood. Anti-Aging Tonic- Along with it's benefits to the brain, Gotu Kola also helps to improve immunity and reduce the appearance of aging by improving the skin and circulatory system. It's also a powerful antioxidant and is currently being studied for it's use in treating certain cancers. Hair and Nails- Gotu Kola has been shown to increase hair growth, and in some cases to even help repair hair loss. Varicose Veins- Gotu Kola strengthens the walls of the blood vessels, helping to improve the circulatory system in general, but also helping to reduce the appearance of varicose veins. Anxiety- Several recent studies have shown that Gotu Kola has a beneficial effect on patients with General Anxiety Disorder (GAD). It has been shown to reduce the frequency and duration of anxiety attacks. Summary of actions- Alterative, antibacterial, diuretic, febrifuge, nervine, rejuvinative, and adrenal purifier. Used for eczema, epilepsy, insanity, hypochondria, intermittent fevers, hair loss, immune boost, longevity, memory, nervous disorders, psoriasis, senility, chronic skin conditions, tetanus, convulsions, and bowel disorders. Improves circulation. Rejuvenates brain cells and nerves, promotes intelligence. Cautions and Contraindications- May be harmful to your liver if taken too long, or if you have a pre-existing liver condition. Large doses are not recommended for small children or in pregnancy, however small doses should be safe. It's best if you consult your doctor/midwife/herbalist first. Gotu Kola may interact with certain prescription medications. If you are currently taking sedatives, blood pressure, or any other medications, please consult your doctor and/or pharmacist. I only included a basic introduction to this amazing herb. I hope you enjoy hunting for this little powerhouse. If you have any questions or comments, please leave them below. Gotu Kola i once read about this somwehere but don't remember actually where but detail view about this is very interesting.No doubt herbs are very useful for human life. I'm glad you enjoyed this post. Herbs are helpful as allies to help us deal with different problems in life, but they're also quite tasty and have quite a bit of nutritional value.